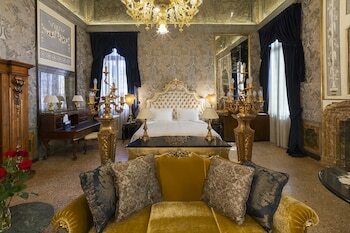 A stay at Palazzo Venart Luxury Hotel places you in the heart of Venice, within a 10-minute walk of Rialto Bridge and St. Mary of the Friars. Featured amenities include a business center, complimentary newspapers in the lobby, and dry cleaning/laundry services. For a surcharge, guests may use a roundtrip airport shuttle (available 24 hours) and a train station pick-up service. With a stay at this apartment in Bologna (Navile), you'll be within a 15-minute drive of Stadio Renato Dall'Ara and BolognaFiere. Free self parking is available onsite. Located in Lucca, Piaggine is in a rural location, within a 15-minute drive of Porta Sant'Anna and Porta San Pietro.